I finally got the Detangler Brush for Christmas and I could not have been more excited! I had wanted one for the longest time, so I asked for it as a stocking stuffer and there it was Christmas morning. I used it as soon as I got it, and I think that it’s the best brush that I’ve ever used. I got the pink Detangler Brush, which is for fine hair, because my hair is on the thinner side. I don’t have a lot of hair, but the hair I have gets so tangly throughout the day. It hurt to brush or comb before, to the point of frustration. So, that’s why I have been wanting to try this product for so long. It easily detangled my hair and it was painless! The best part is that there was barely any hair left behind in the brush. My regular round brush would always have a ton of hair left in it, but the detangler brush is much different. I think this was a fantastic gift and I love my mom so much for getting it. I think that I’ll probably give this as a gift to my friends for birthdays and holidays too because I think they’ll love it. 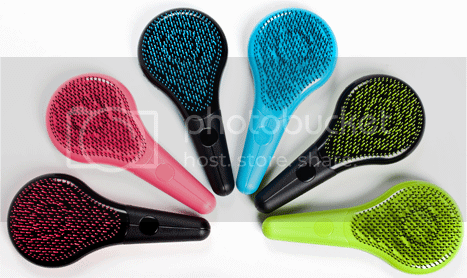 Order the amazing No Tangle Brush here! ← Only A Few Days Left to Get The Mercier Detangler Brush for Christmas!